Peter Hordern was a versatile utility forward who played 91 games for Gloucester between 1930 and 1937 at prop, flanker or No 8 and was capped four times for England. He played county rugby for Devon, North Midlands and Hampshire and appeared a remarkable 19 times for the Barbarians, twice as an emergency full back. He toured Argentina with the 1936 Great Britain side. Peter Cotton Hordern was born on May 13, 1907 at Berkhampstead, Hertfordshire. He was the son of a captain in the Royal Indian Marines and the brother of the actor, Sir Michael Hordern. He was educated at Brighton College and played both rugby and cricket for the school. In his first two years at Oxford, he failed to get in to the University side, but played for Blackheath and Old Brightonians. He won a blue in 1928-29, his final year. He also played cricket for his college and Old Brightonians. On leaving Oxford, Hordern took a teaching post at Monmouth High School and joined Newport RFC for the 1929-30 season. His family lived in Devon and he played for Devon in the County Championship. 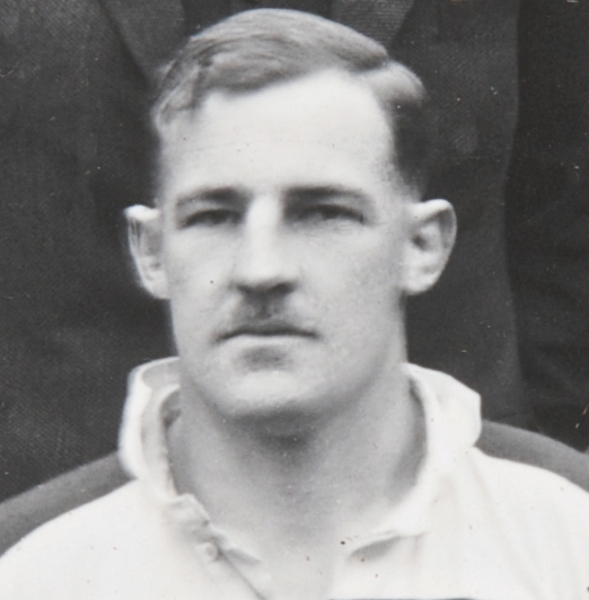 His close friend and colleague at Monmouth High School, the Scottish international Donald Crichton-Miller (Peter was best man at Donald’s wedding) had joined Gloucester at the same time and on February 1 1930 Hordern made his Gloucester debut, guesting against United Services at Kingsholm as a late replacement at centre threequarter. On April 12 1930, while staying with his family in Devon during the Easter holiday, he guested for Gloucester again against Devonport Services as a back row replacement for Crichton-Miller. In 1930-31 Hordern was in impressive form for Newport and gained international recognition. Early in the season he had guested a third time for Gloucester, playing in the back row alongside Crichton-Miller against Donald’s old side Bath on September 25. Hordern scored two tries and Crichton-Miller the other in a Gloucester win at Bath by 2 goals and a try to nil. Hordern then played in a Newport win at Abertillery three days later. He played in all three England trials that season and was chosen to make his international debut against Ireland. This led to a fourth and final guest appearance for Gloucester. The Citizen reported “At the request of the Rugby Union Peter Hordern (Newport) who has been selected for England against Ireland at wing forward, was included [in the side to play United Services] to give him some practice.” He retained his place against Scotland and France. In 1931-32, his last season with Newport, he led the pack and played for Newport against the South Africans and for the Barbarians against Leicester. Peter Hordern took a post at BromsgroveSchool and joined Gloucester for the 1932 -33 season, playing regularly at prop or in the back row. He played at prop for the Barbarians on their Easter tour and made his debut for North Midlands in the County Championship. In January 1934 he played at No 8 in a 9-0 victory for England over Wales at Cardiff, his fourth and last international. He was selected to play in the next game against Ireland, but had to withdraw and was not selected again. In April that year, he played as an emergency full back for the Barbarians against Swansea and Newport on their Easter tour. They won both games! He was still in contention for an England place the following season and played for the Probables in the second England trial, for North Midlands and for the Barbarians. From 1935 to 1937 Hordern continued to play regularly for Gloucester and took over from Wadley as pack leader. In 1935-36 he played county rugby for Hampshire and played in the side that beat Northumberland in the County Championship Final. He also represented Hampshire & Sussex against the All Blacks. At the end of that season he was one of two Gloucester players to be selected to tour Argentina with the Great Britain side (John A’Bear was the other). Not quite a Lions squad (it contained 11 uncapped players and no Welshman) the side was nonetheless a strong one, which won all ten matches handsomely. Hordern gained some notoriety for a never-to-be-forgotten incident, when he accepted a hefty wager from Prince Obolensky to shampoo a noted Argentine politician, who was sitting opposite him, with tomato ketchup. Peter Hordern retired from top class rugby at the end of the 1936-37 season but continued to referee for several years. He had been a Pilot Officer in the Reserve of Air Force Officers throughout the thirties and served as a Flight Lieutenant during WWII. He won the Air Force Cross in 1944 and was promoted to Squadron Leader. Staying in the service after the war, he was promoted to Wing Commander in 1954. He died in Peterborough on June 22, 1988.